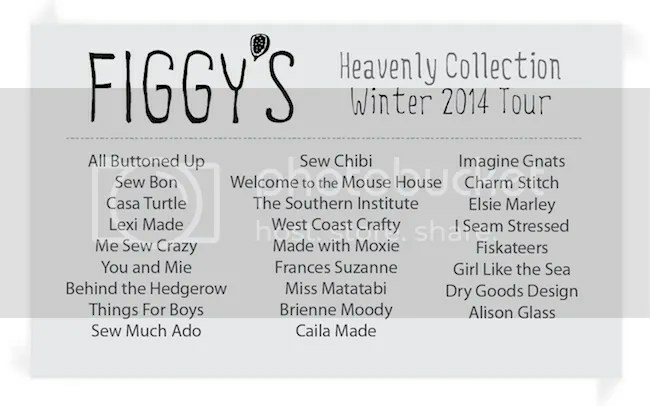 Have you seen the new Heavenly Collection by Figgy’s? The collection is made up of 7 super unique and stylish patterns for kids and some of them for young adults. When Shelly contacted me about being a part of the Heavenly Tour, I jumped on board immediately. I was drawn to the Ethereal Dress & Blouse. 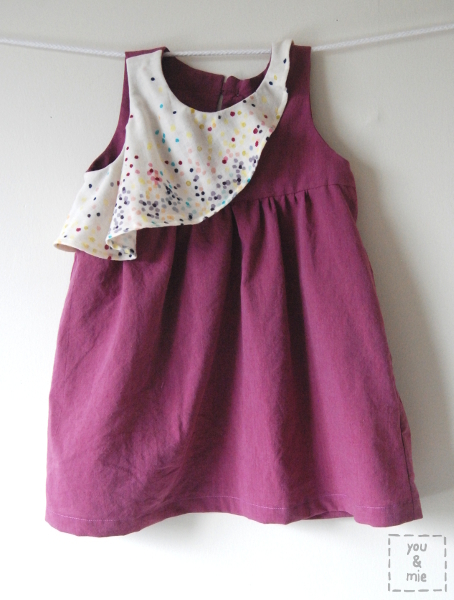 And what a sweet little dress this is! The construction is a very standard bodice with a gathered skirt – the frill is what makes it so special. It can be made in shirt, tunic or dress length and with long sleeves, short sleeves or no sleeves. The dress came together really easily and adding the frill was pretty straightforward. 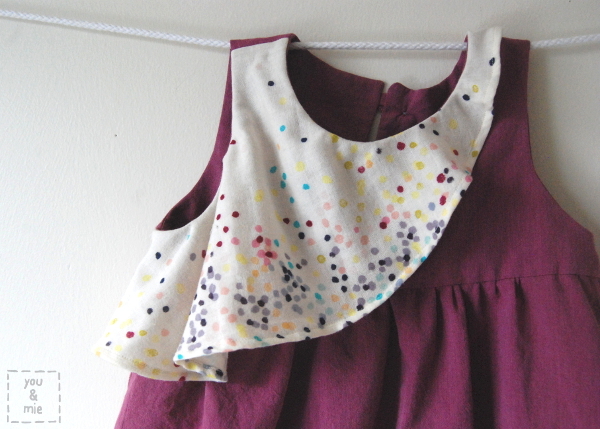 The pattern directions were clear and easy to understand and produces such a unique little piece for your kiddo’s wardrobe. 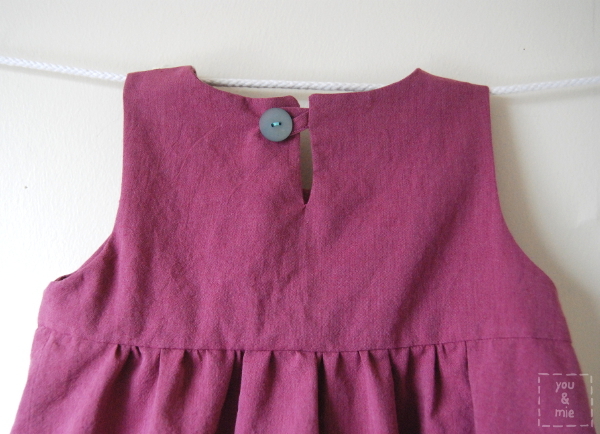 For the sleeveless and short sleeved version, the bodice is fully lined and is finished with a technique that looks great, but might be a little confusing if you’ve never done it before. Shelly has broken it down a little bit more in this post here and Rae of Made by Rae has a fantastic video for lining a Washi dress bodice that is the same technique. I recommend checking those out if you’ve never finished a lined bodice like the pattern instructs. Super helpful! And what fabric could be more ethereal than some Nani Iro double gauze?? 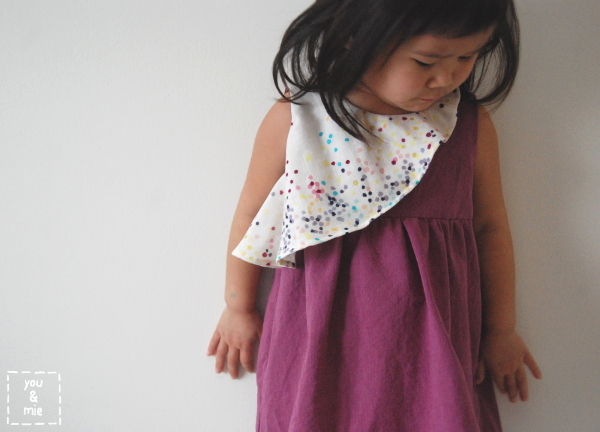 You might recognize this Nani Iro Melody Sketch from this A-line tunic I made a couple years ago and I said it then, and I still think even now, that this is my favorite fabric ever. I have a little bit leftover from the tunic, but not enough for a whole dress, so I used it for just the frill. The rest of the dress is made from a really lightweight shot cotton that I used on a dress for Sanae’s daughter for the clothing swap last year. I love these fabrics together – both so airy and soft, yet clean and crisp. I’ve found that Figgy’s patterns run pretty large, so be sure to check the size chart and not just choose the size by the kid’s age. I made the 18 month size for my 3 and a half year old and made the “full length” dress version but shortened it by a few inches. It fits great and the bodice even has a little room for her to grow into! The back has an opening with a button and loop closure. So simple and so sweet! The Ethereal Dress & Blouse pattern can be purchased individually or with the entire collection. I like a lot of the patterns in the collection, but I definitely want to sew up the Stellar Tunic/Dress next! Shelly is also hosting a huge giveaway on the Figgy’s blog with the prize including fabric, sewing supplies and the entire Heavenly pattern collection. Check out all the details and entry information here! Thanks for stopping by and be sure to visit the other stops on the Heavenly Pattern Tour throughout the month of February. Can you believe Valentine’s Day is this week!? Doing any special sewing for the lovely holiday? 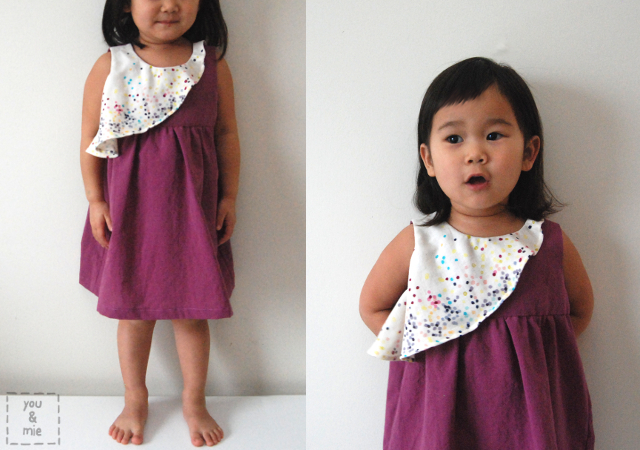 This entry was posted in pattern review and tagged dress, Ethereal Dress, figgy's, girls by Cherie. Bookmark the permalink. Oh my goodness!! This dress is adorable and so is Yuki’s new haircut! This is so cute! I love it! Isn’t it nice to be able to use leftover special fabric? I have a few small remnants that I’ve hung onto because I love them so much- this is a great way to use them! I’m trying to sneak in a project for my husband this week. Hopefully I’ll get it done! It’s been made a little trickier as he’s working from home this week, so I don’t know if I’ll be able to keep the surprise! Yes! It’s so true. I still have a little more of this specific fabric that I’m still holding on to. I might be able to use it for a pocket bag or something. Haha! Were you able to finish your Valentine’s project for your husband!? So pretty!! I wasn’t going to sew a dress for my stop on the pattern tour, but am going to now with some double gauze. Muhahaha – double gauze – gets you every time. Can’t wait to see what you make! Aw I love this so much Cherie! 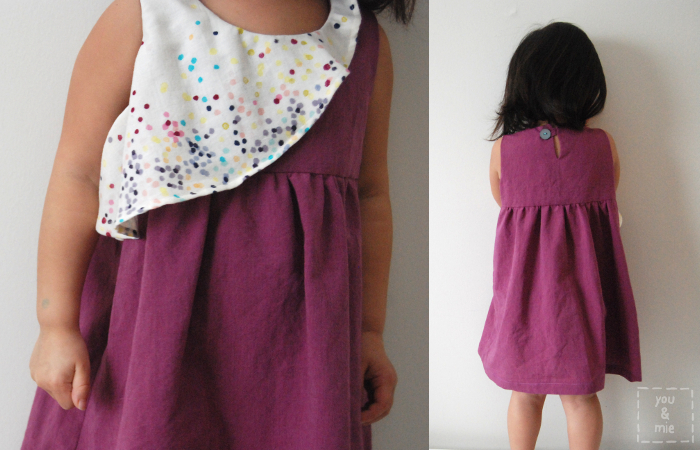 Those fabrics are adorable together, and she is just too cute! How unusual ! It looks lovely and she is such a beautiful little girl! Thanks Laura! I learned the understitching trick from Oliver + S patterns. It was really apparent on mine that the lining was rolling up. Love your version too! Adorable! The understitching tip is really helpful too! Hi, This dress is so cute! I already have the pattern. Glad to know it runs bigger. As always Cherie, I love your fabric choices! Do you buy them online? We have a store in Ventura called Superbuzzy, I think I mentioned it once to you, but they are the only place anywhere in So Cal where you can find Nani Iro, I think.